If nothing else, Aloha isn’t shy about playing in popular categories. Charron, a former brand manager at PepsiCo and a senior VP of marketing at Chobani during that brand’s initial foray into beverages, has experience launching drink products. 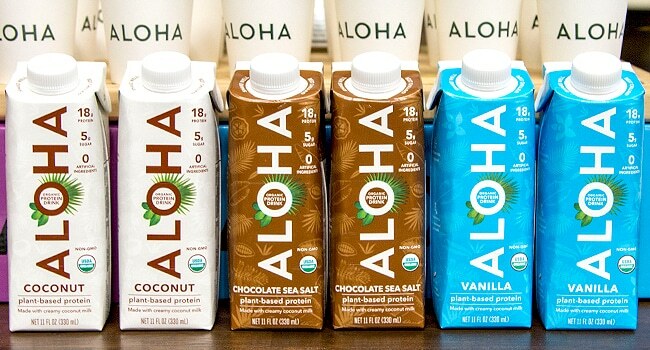 In the case of Aloha, the brand’s established principles helped dictate the direction of the protein line’s development. Like its protein bars, Aloha’s protein drinks are organic, vegan, non-GMO, and free from gluten, dairy and artificial ingredients. The company is seeking to highlight the use of a coconut milk base and the addition of prebiotics, and electrolytes and MCT oil from coconuts. The line — available in chocolate sea salt, coconut and vanilla varieties — contains 18 g of a proprietary pea and brown rice-based protein blend and is sweetened with monk fruit. The products will be sold in 4-packs (MSRP $11.99) and single bottles, and are available in 12-packs on Amazon. “It was a combination of mandatories, then going into R&D and figuring out how can we execute this to the best of our abilities and to the point where we really feel we have something truly unique in a market that’s very crowded,” Charron said. Aloha’s move into beverage isn’t its first experience with drinks, however; the company previously marketed dry tea sachets. Yet it does set the brand up to compete in an increasingly competitive field of plant-based protein drinks. In recent years, plant-based beverage brands such as Ripple, REBBL, Koia, OWYN and Cytosport (via Evolve brand) have emerged as notable names in the segment. Note: An earlier version of this story inaccurately stated the MSRP for 4-packs to be $14.99. The article has been corrected.